The late majority has arrived. They’ll only use a user-friendly product - as they define it. Is your product losing users - or failing to attract them in the first place? Does your e-commerce store have high cart abandonment? Are your free SaaS customers not upgrading to paid plans? Are you considering a redesign? Get realistic advice to boost your target audience’s conversions for 1/60th of the cost of a typical redesign. Do your stakeholders or users pull your product’s design in every possible direction? Do they tend to request major UI changes right before or after release? Does fixing one person’s UI bug just make someone else complain louder? Do you not even know whether to ship an iOS app, Android app, desktop product, web app, or website? Make sense of it all, achieve better alignment with your stakeholders and users, and build a product your target audience loves. Do you have a difficult product problem that requires an iterative solution? Are you unsure how to please very different users with the same product? Does becoming your client’s trusted partner for these challenges require working with an expert longer-term? Solve your clients’ and users’ real needs, move past being an “order taker”, and focus on the work you enjoy. My ebook helps development agencies become trusted partners who release products that attract and retain users in their clients’ target markets, instead of order takers who build every requested feature that looks technically feasible. 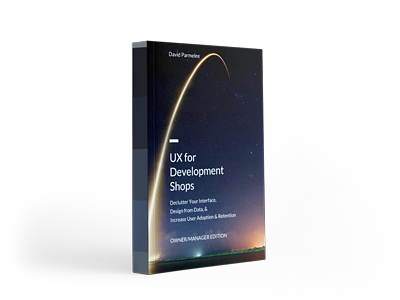 This Owner/Manager Edition has strategic advice that helps owners of development shops and managers of developers to increase conversion rates and improve user acquisition and retention. 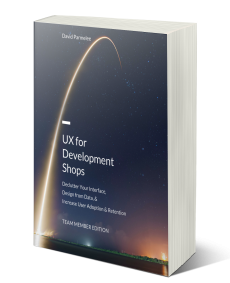 The Team Member Edition of UX for Development Shops has the tactical advice: just what your team members need to know to create better UIs for your users, customers, or clients. UI guidelines: Should you use off-the-shelf guidelines or write your own, and when? Visual design: This brief overview gives developers some high-level advice when they need to do visual UI design. Step-by-step guide to usability studies: This guide helps you avoid common traps in usability study recruitment and setup so that you will get the best ROI from your studies. Landing page analysis of 33 top products: Can you copy what bestselling apps and software products are doing and expect to succeed? In this guide, I show you what you should copy, what you shouldn't - and where even the most successful companies are leaving money on the table.